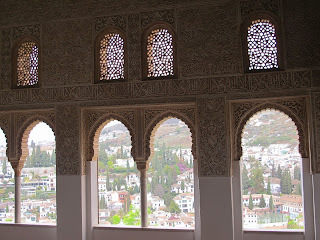 Our final stop in Andalucia was Granada, a 2 hour 20 minute train ride from Seville. 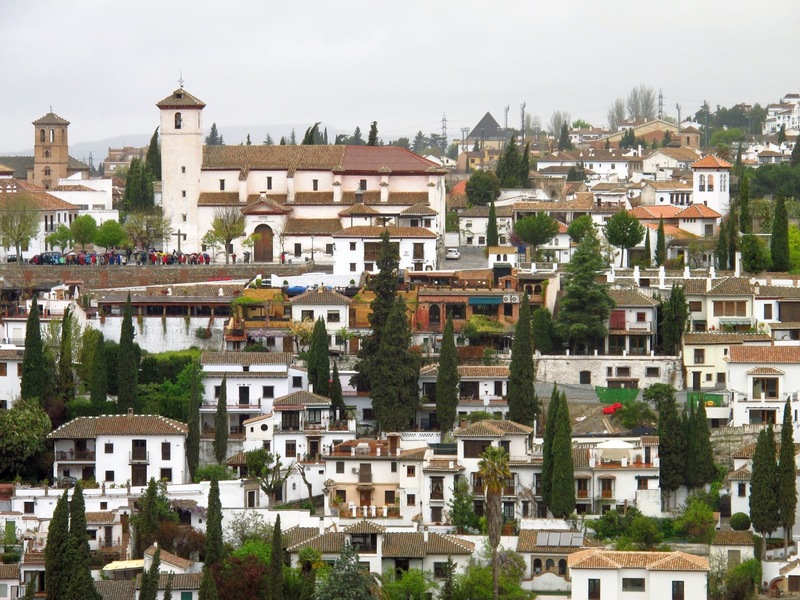 Arriving into Granada, you are surrounded by the snow capped Sierra Nevadas, with 2 steep hills in town opposite each other. 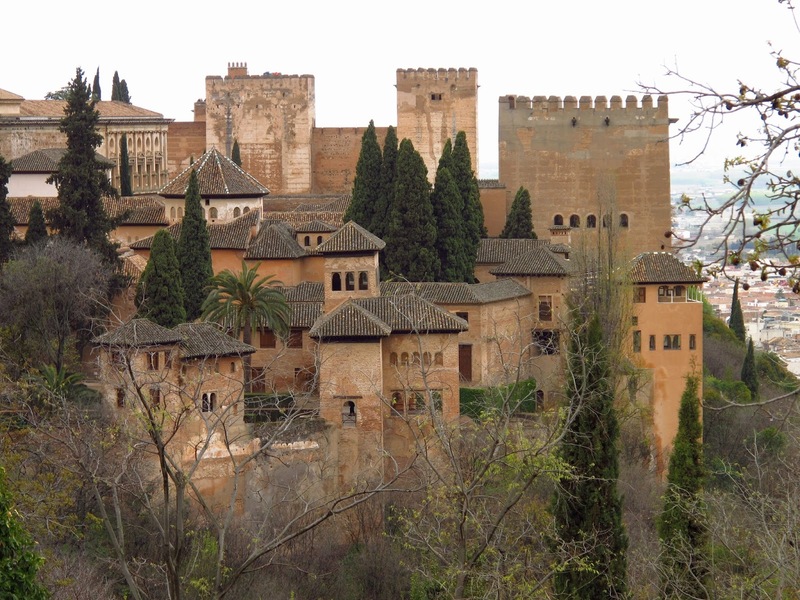 One hill contains the winding streets of the Albayzin Jewish neighborhood, which provides a nice view of the sprawling Alhambra across from it. Before we climbed each, we got our sustenance at Spanish institution, Bodegas Castaneda. I had a wonderful dish of spinach, chick peas and chorizo. It was washed down with a refreshing local, Alhambra Especiale beer. We started our Granada visit with a lesser known church, the Monasterio de San Jeronimo. This monastery is a few blocks from the city center and worth the walk. When we arrived, we could hear the nuns singing vespers as we walked around the property. The tiny church is the hidden gem with elaborate work on the ceilings and many colorful displays everywhere you look. We then went to the main Cathedral, which was flush in white and gold, and provided a nice contrast to San Jeronimo. We wandered the streets of Granada after until we literally stumbled on Cafe Futbol, which I had read was the best place for churros and chocolate, so we had no choice, and we were not disappointed. The churros were done to a perfect crisp on the outside, and nearly hollow inside, which made for a perfect dipping wand in the warm, thick chocolate. We now had our sustenance to climb the steep, tight streets to the Albayzin neighborhood. There were many good views along the way, but the best was at the top on Plaza de San Nicolas. 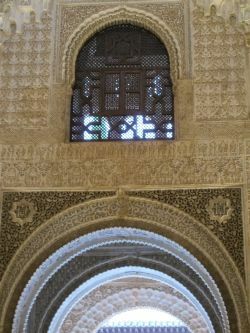 Actually that was the next best, as we had made reservations at El Herto de Juan Ranas where we had a drink on the terrace, followed by dinner in the dining room, which gave us great glimpses of the Alhambra from sunset to sundown. This is also where I finally tried the Sangria. I was leery of drinking it as I saw some of the drinks being made with Sprite and jug red wine, but everyone was partaking. The one here seemed a bit more authentic as it at least had real fruit in it. It was tasty, but I still think they're missing a few things. Our dinner was excellent. I was very happy with my cod on a mustard bed with sauteed mushrooms, and Stephanie had pastilla, a Moroccan dish that I had attempted to make with my group in Marrakech, and suffice it to say, her's was much better. 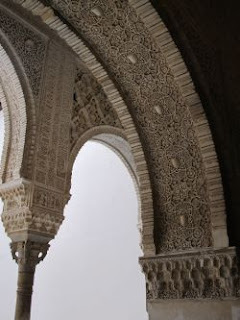 Unfortunately the next morning we woke to rain that would stay with us all day as we toured the Alhambra. Rain gear in hand, we set up the hill to explore. 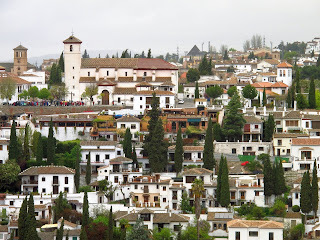 We were still able to enjoy some views to Albayzin and the restaurant where we were hours before. 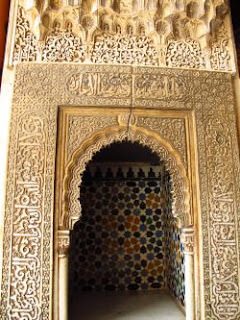 The Alhambra is home to many well decorated palaces, gardens and fortresses to protect everything within. 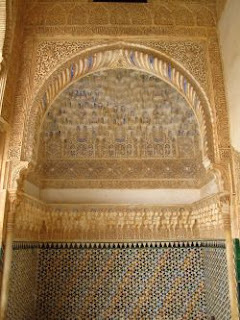 Placios Nazaries houses many architectural wonders with a series of gorgeous palaces with intricate work in every corner. In many places, you could see the Arabic inscription of Wa la ghaliba illa Allah, which means, "there is no conqueror but God." 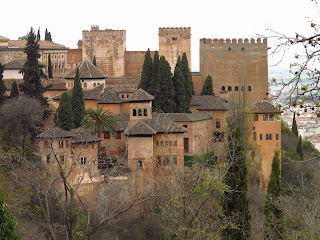 We then wandered the wet gardens over to Generalife. 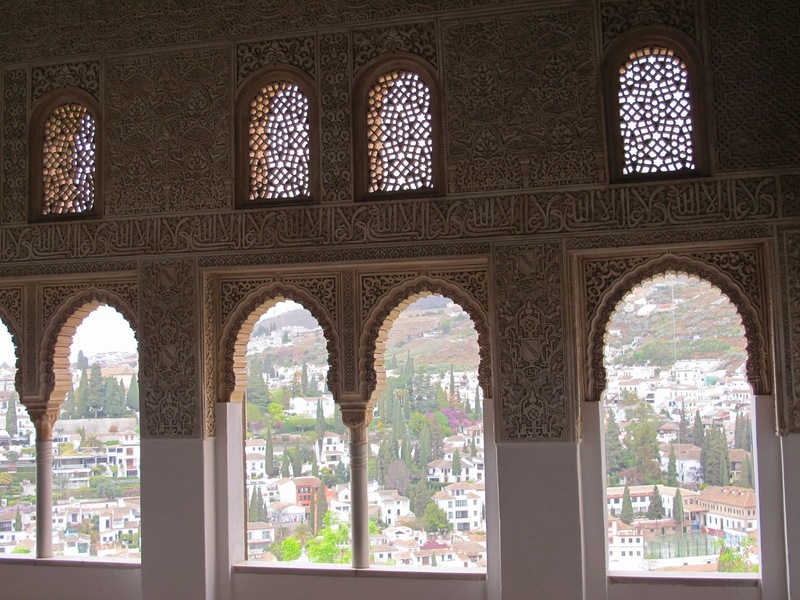 Generalife comes from the Arabic jinan al-'arif, meaning the overseer's gardens. There were topiary gardens, and pools, and fountains with epansive views everywhere you looked. After 3 hours exploring the Alhambra, we had the afternoon left for "something" before we needed to catch our flight back to Paris. Spain has very specific hours for doing, or rather, not doing things. The shops all close from 2-5pm everyday, which for tourists, can be difficult as that's prime exploration time. Most restaurants are closed 4-8p, so you need to plan everything accordingly. At this point, we had no options, but to go eat until our plane took off, and perhaps have a farewell drink or two. We heard about a street, Calle Navas, where you could do a "tapas crawl" due to the close proximity of many restaurants all right next to each other. So we jumped into the first one and had some wine and grilled shrimp. Another bonus is that not only is the wine only about 3 euros for a very healthy pour, on this street in Granada you also get free tapas with each drink. With our first drink we had free paella with chicken. The next stop we were given pork and potatoes. Then there was couscous, and another vegetable dish. So we enjoyed some free, decent, hearty food, and yes, we ended up having several drinks. With no shops open, we had no choice. We also learned at about 3pm on this random Saturday, it turns into quite the party street, with many people in costume, and many bachelor/bachelorette parties thoroughly enjoying themselves. Stephanie had to jump in for a picture with the matadors. There were men in tutus, superheroes, women with megaphones, which seemed like a good idea gone bad within about 10 minutes. Eventually there was dancing, and it was the perfect way to end a fun week in Andalucia.